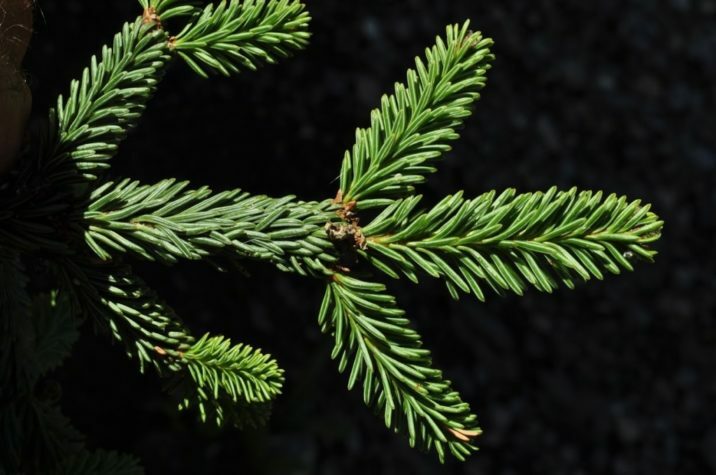 Abies vejarii, first described in 1942 by Maximino Martínez (1888–1964), is commonly known as Vejar fir or as Abeto de Vejar in the Spanish language. Description. 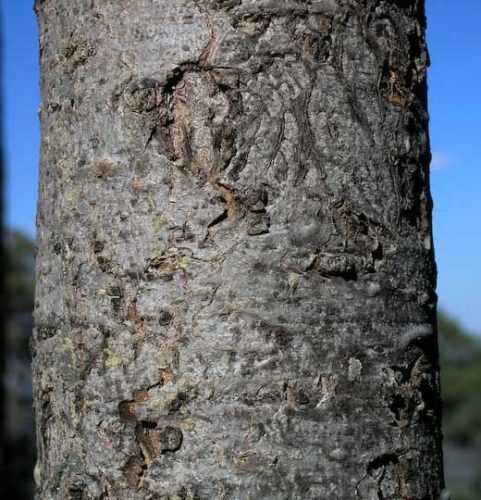 Vejar fir is an evergreen coniferous species of tree which will grow to mature heights of 110 to 130 feet (35 – 40 m) tall. The leaves are needle-like, moderately flattened, 0.4 to 1 inch (1 – 2.5 cm) long and 0.05 to 0.08 inch (1.3 – 2 mm) wide by 0.04 inch (1 mm) thick, grey-green with scattered stomata above, and with two greenish-white bands of stomata below. The tip of the leaf is acutely pointed. 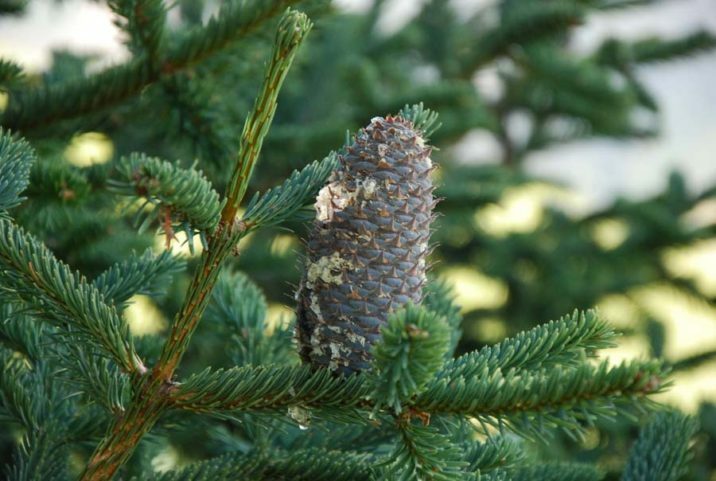 The seed cones are glaucous purple, maturing grey-brown, 2.4 to 6 inches (6 – 15 cm) long and 1.6 to 2.4 inches (4 – 6 cm) broad, with about 150 to 200 scales, each scale with a bract of which the apical 0.12 to 0.32 inch (3 – 8 mm) is exserted on the closed cone, and two winged seeds. The seed cones disintegrate when mature to release the seeds. Distribution. This species is native to Mexico — southeastern Coahuila to Nuevo León and western Tamaulipas, in two disjunct areas in the northern part of the Sierra Madre Oriental of northern Mexico. It is found in high mountains at elevations of 6,400 to 10,500 feet (2,000 - 3,300 m) above sea level where the climate is cool, with dry summers and wet winters. Abies vejarii at Sierra de La Marta, above Rancho Los Oyameles at 10,040 feet (3137 m) elevation. 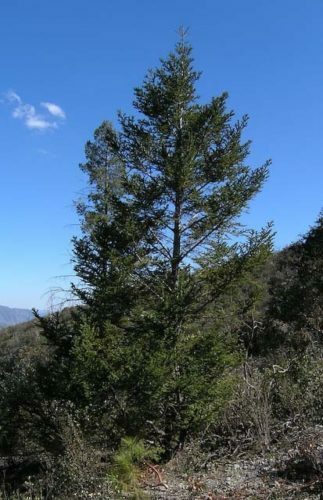 a specimen of Abies vejarii about 10 m tall, growing in habitat on Cerro Potosí, Mexico. Sun foliage of Abie vejarii from the Sierra La Marta, Coahuila, Mexico.